In honor of its ninth year as an official sponsor of the Monaco Yacht Show, Ulysse Nardin unveils limited edition Marine Chronometer Annual Calendar Monaco watch. This year marks the ninth year in row that luxury Swiss watch brand Ulysse Nardin has been the official sponsor of the Monaco Yacht Show. To mark the brand’s support of the world’s largest mega yacht exhibition, Ulysse Nardin unveils a limited edition Marine Chronometer Annual Calendar Monaco watch. 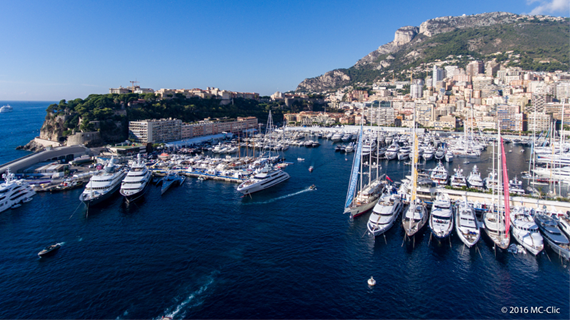 The highly-anticipated event, where some of the most luxurious yachts in the world are on display, takes place at Port Hercule beginning September 27 under the patronage of HSH Prince Albert II of Monaco. The Monaco Yacht Show is a perfect partner for Ulysse Nardin, whose seafaring heritage stretches back to 1846 and is best reflected in the brand’s Marine Chronometer collection. The new Marine Chronometer Annual Calendar Monaco watch is inspired by the historic marine chronometers upon which the brand first built its reputation. The watch incorporates the annual calendar — something Ulysse Nardin first presented in the Marine Collection just last year — and in doing so cut back the complication from 30 parts to just seven. The calendar enables date setting backwards and forwards. The new Marine Chronometer Annual Calendar Monaco watch is powered by the UN-113 caliber, a movement – with silicium escapement and balance- spring – that is made entirely in-house at the Ulysse Nardin workshop. With its COSC-certification, the precision self-winding movement also offers 60 hours of power reserve. 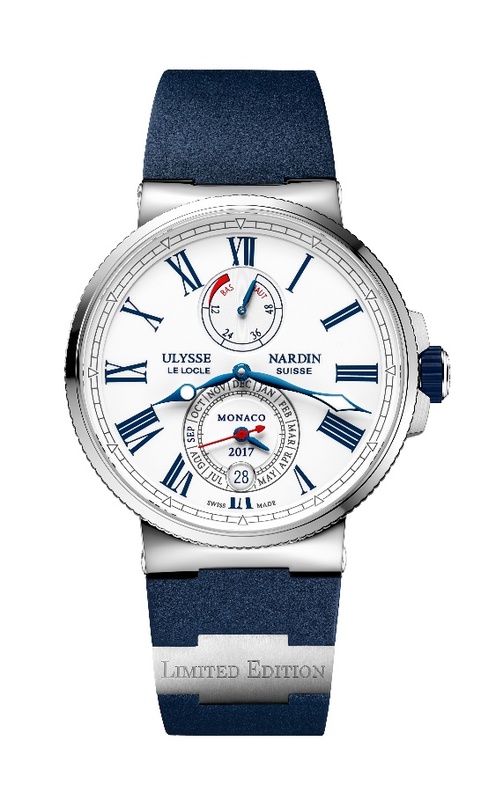 The white lacquered dial features Roman numerals and indices in blue and the words “Monaco 2017” are inscribed on the dial. The dates of the event (27, 28, 29, 30) and the month of September are also highlighted in blue. Water resistant to 100 meters, the 42 mm stainless steel case with fluted bezel features anti-reflective sapphire crystal and caseback. Just 100 pieces will be made, each retailing for just under $10,000. 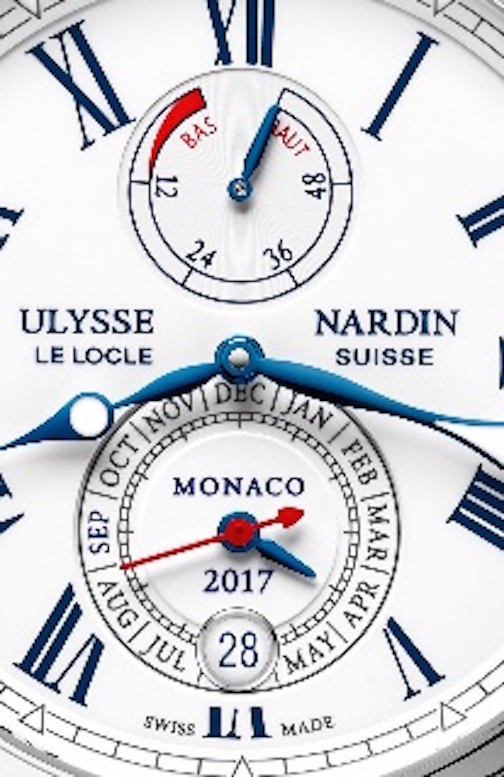 The Ulysse Nardin Marine Chronometer Annual Calendar Monaco watch for the Monaco Yacht Show 2017. Movement: self-winding caliber UN-113; In-house designed movement; Silicium escapement and spring, 28’800 v/h 55 jewels; 60 hours of power reserve.